I had plenty of subjects to write about today, especially since I spent the last 2 days at the Forrester Finance Forum. However, the amount of traffic on the site increased three fold because of my last post, so since the people have spoken, give them what they want. Yesterday at the Forrester Forum, Jon Kaplan Google's Finance Category Chief (not exactly sure what his title is, but that sounds pretty good) gave a presentation on what your world will look like courtesy of Google. Unfortunately, they haven't posted all of the presentations yet and because they announced that they would be posted, I did not take detailed notes (I hate it when they do that). The one quote that stood out for me, however was "There is no online or offline, just return on objective marketing" which is very thought provoking. So, let's examine what that could mean. Ok, first let's take a look at Google's strategy for capturing marketing dollars, err I mean helping marketers. It starts with a simple chart found over in Google Press Center from their last Analyst Meeting. 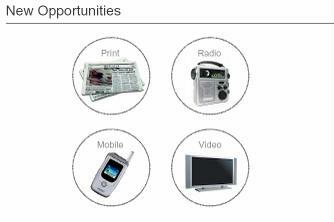 See they are just not interested in search they also want to look at capturing print, radio, mobile, and video. Google wants to align around your marketing goals and as Kaplan said yesterday "serve the right ad to the right person at the right time". Now let's take a quick spin around the Google Revenue Opportunity Big Wheel, Bob Barker fans. Next on the big wheel is video. As announced yesterday, Google will now allow advertisers to serve video adds on a CPC or CPM basis. These videos will be served as a flat image with user-initiated video. Plus, they are keyed off your current keywords, you can opt-into sites, and geo-target it. Now, while I think this is a great move into online video because it will extend the reach of plain old TV commercials and ties in nicely with the major networks offering TV shows online, I think we need to temper our enthusiasm just a little bit. First of all, it assumes that users will want to turn on the video as opposed to what they do now which is get a beer, run to the can, or pound through them with TiVo. Second, and probably the more damaging of the two, it is ONLY available in content targeting. You remember content right? The area that I recommend turning off or down to a minimum for most of my clients. Finally, on the big wheel is mobile and this is where it really starts to get interesting. Google believes that it is a big opportunity and I think the talk yesterday scared some people (not me of course). Jon spoke about the opportunities presented in qr codes being used in Japan. Not sure what qr codes are - check this out over at Wikipedia. What you could do with a qr billboard next to say a Disney Store is that when you point your qr enabled cell phone Disney pushes out a coupon to you. Seems harmless enough right? Well, lets think about this scenario. Let's say it was your 12th wedding anniversary on Monday and you forgot to make a reservation for dinner and oops, you are stuck in a meeting. So, you pull out your Treo 700W and log onto your Google homepage. You type in your favorite Italian restaurant in Madison NJ (Il Mondo Vecchio) to get the phone number, but instead you hit a click to call ad served on the right. Bingo you get the reservation and your wife is thrilled. The next day you are in NYC at a conference and the lunch is not very appetizing. So, you go outside and see one of those billboards and point your phone to get a coupon. Unfortunately, instead of getting the hamburger ad you wanted, you download a coupon for the pizza restaurant because Google knows you like Italian. Hmmmm, seems like plenty of revenue opportunity for Google. Now there are two things that are really needed here. One is better tracking and two is the integrated channel marketing client. From a tracking perspective I don't mean AdWords because there is a lot of good data and tracking already available or dMarc because that's what they are using for radio and print. In order to do this, Google will need to build an integrated tracking platform so that all of these measures come together and that includes some definitions around reach and frequency. Plus, some metrics around brand awareness which goes beyond Google Trends would help too. I love Google Trends, but without some numbers on the Y axis, it is hard to justify a bump due to advertising (try this one on your CMO using the chart - yes, that little wiggle in the graph is due to our spend on Google print. No I don't know how much I increased week over week, but trust me it is a BIG BUMP.) HEY GOOGLE - WE NEED NUMBERS, PERCENTAGES, SOMETHING ELSE ON THE Y AXIS!!! Next up is the integrated channel marketing client and that is someone besides the CMO. The last time I checked most organizations that even realize the internet is around split their groups into offline and online organizations; then they even may split it further by retention versus acquisition. What Google will need to make this vision happen is an organization that measures the value of marketing to a person and not to an impression or a GRP. Your world delivered via Google could happen soon, but what would speed the process up is something that I'm sure Google's engineers are tinkering with - that's the Google Marketer, available of course on a cost per idea basis. Video Ads? I like this idea. Some internet sites resemble more and more TV programs and not newspapers and magazines as before. So, google just helps them to move in this direction. Good review about internet marketing.I really like the layout, and your information is very thorough.I just come across a blog were one get the details of online marketing. I was just looking around for material on internet marketing and stumbled on your post. Nice post. I’m still looking for materials for my research.